Beth Cornelison first sold to Harlequin in 2004. Her Harlequin Romantic Suspense (Intimate Moments) debut was To Love, Honor and Defend and since then, she has written twenty-two books for Harlequin. What she loves most about writing for Harlequin is the loyal and enthusiastic readers. 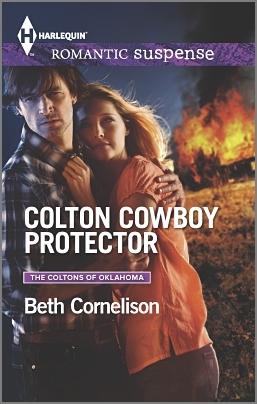 Don’t miss Colton Cowboy Protector out now! Follow Beth on Twitter and Facebook! 1. What book first got you hooked on Harlequin? 2.How did you celebrate selling your first manuscript? I called family and writer friends to share the happy news, and it seems like chocolate was involved. Lots of chocolate! 3.Which of the many books you’ve written has stayed with you the most and why? So many have! But I worked in a bit of an homage to my grandmother in The Christmas Stranger, and that book was a finalist in the RWA Rita contest. That book has a sentimental attachment for me. 4.What’s top of your TBR pile? At the moment, I’m reading books as a judge in the Rita contest but I’m hoping to work in Kristan Higgins’s In Your Dreams. I love her books! 5.What book do you wish you’d written and why? There are many classics that have stood the test of time: Pride and Prejudice and Gone with the Wind to name a couple, Harry Potter more recently. I’d love to pen a book like these that makes readers fall in love with reading and stands the test of time. 6.What’s harder – first or last lines? For me, last lines. I really want to leave the reader with a smile and a tug at her heart. 7.How do you choose your characters’ names? Sometimes I try to find a name with an underlying meaning. I did this in my Bancroft Brides trilogy for the sisters. Other times I just test out names until I find one I like that also fits the character. 8.How do you push through writer’s block? I’ve been known to write scenes out of order just to be putting words on the page. Music has always been good for my muse as well. It really stirs my imagination and gets the words flowing again! 9.What’s the best career advice you’ve ever had? Never give up! Read widely and be persistent! I chew a lot of mint gum while I write. 11.Who is your favourite fictional couple? How do I pick just one? I’ll say Claire and Jamie from Outlander, because I’m new to the series and loving it and the TV version airing in the US. 12.If you could rewrite your life, what would you change? Not much. I am where I am today because of everything that’s happened, and I love my life, my family and my friends! 13.What would your readers be surprised to know about you? I leave all the adventure and daring to my heroes and heroines. I’m rather a chicken about anything daring! 14.What is your most overused word? Oh, my…probably “sighed.” Writing suspense, my characters are quite often frustrated with each other and express it by sighing. They also sigh when tired. a public relations specialist. I actually was for a while. That’s what my degree is in. 16.When was the last time you said ‘I love you’? Today. It is important to tell our family and friends every day! 17.What does love feel like? Sweets. Especially ice cream. I know it goes straight to my hips, but I love the stuff! 19.What’s your most romantic song? strong moral fiber and a respect for his heroine.